Broken toilet, basin or bath? If it was fitted in a British bathroom from 1970s to the present day, we may be able to help you. We have a vast stock of baths, basins, toilet pans and toilet seats, cisterns and cistern lids and bidets in an extensive range of styles and shades. 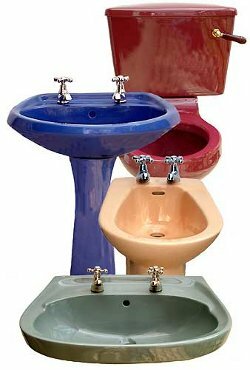 Whatever your requirement - from replacing a cracked basin to a new bathroom suite in an old colour - D.Cole Supplies offers a prompt and professional service, sending sanitaryware across the UK. Call or email your enquiry for models by Allia, Armitage Shanks, Balterley, Barrhead, Celmac, Doulton, Fordham, Ideal Standard, Lecico, Porcher, Pressalit, Roca, Qualitas, Selles, Shires, Spring, Trent, Twyfords, Vitra and Warnetton. If you would like help identifying your broken item, send a jpg to Jim Cole by email at info@dcolesupplies.com or by mobile to 07900 247532 with a short message and your contact details.